(Opelika, AL) February, 2018 – The MK7 (2015+) Golf GTI can now sit just right with the new “Roll Control” lowering springs from APR. The springs offer a more level ride than stock, this is done by creating a lower center of gravity and by slightly stiffening the spring rate. The result is increased traction leading to higher cornering speeds and improved acceleration. The springs lower the car ½” to ¾” making for a more aggressive stance than factory springs, adding form and function. Though the springs are slightly stiffer than OEM, they do not require replacement dampers. This helps maintain a comfortable ride without greatly impacting the overall life of the dampers. 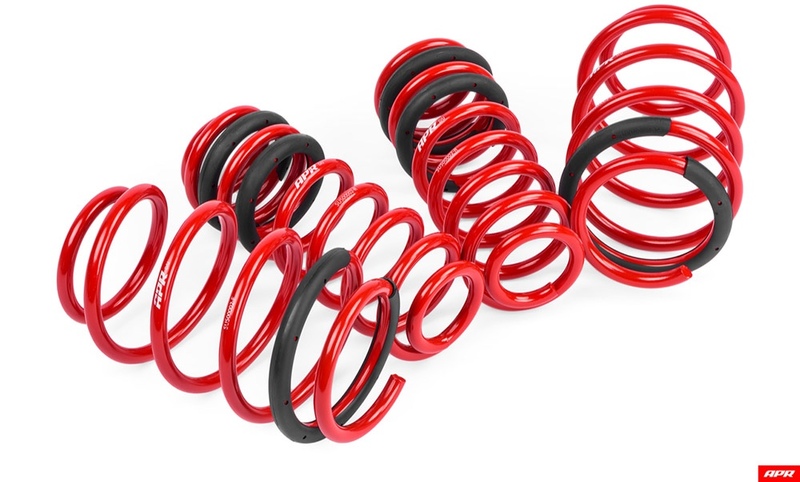 APR also uses the highest quality materials to prevent the springs from deteriorating. To further improve the ride and handling of the MK7 Golf GTI, the lowering springs can be paired with the APR Roll-Control Stabilizing Bars. The bars decrease the differential between inner and out wheel when going through corners, offering even more stability and increasing cornering speed. For more information and pricing, visit www.goapr.com. Founded in 1997, APR is the global leader in performance aftermarket products for Volkswagen, Audi, Seat, Skoda, Porsche, and other vehicles. APR develops and manufactures hardware, software, calibration & data-logging tools for engine and transmission controllers, including intakes, exhaust systems, intercoolers, turbocharger systems, suspension, brake systems, wheels, and more. APR delivers software via a 24-hour automated global delivery system from its 78,000 square foot state of the art facility in Opelika, Alabama. Learn More at www.goapr.com.